KAY-NAH-CHI-WAH-NUNG WAS DECLARED A SITE OF NATIONAL HISTORIC SIGNIFICANCE BY PARKS CANADA CLOSE TO 50 YEARS AGO. The weight of history is palpable at Kay-Nah-Chi-Wah-Nung; it is a place of great significance. The Place of the Long Rapids and the surrounding lands hold the record of more than 8,000 years of recurring use or habitation. The area contains the largest group of burial mounds and associated village sites in Canada. Archaeological evidence suggests that the first residents of Kay-Nah-Chi-Wah-Nung arrived during the Middle Precontact Period. While they did not construct the mounds on site, they did leave their mark as evidenced in locally found artifacts such as stone tools. The first mound builders at the Place of the Long Rapids were part of the Laurel Complex. They inhabited this region from around 800 to 2,000 years ago. At Kay-Nah-Chi-Wah-Nung, Laurel mounds range in size from 18-24 meters in diameter and up to 7 meters in height, and are located along the edges of river terraces, which span the site. Some of the mounds on site were constructed by digging a shallow pit, where the remains of ancestors who had passed would be placed and then covered with earth. Some mounds were continually added to overtime, possibly over the course of hundreds of years. This layering process created the mounds as we see them today. Belongings were sometimes placed with individuals in the mounds. These could include items such as medicine bags, pipes, food, clay pots, and stone tools and might represent items an individual required both in life and death. “A woman Elder was told through a dream that a great sickness was coming. The Great Spirit told her to build a lodge of birch bark. She was told that the birch bark would protect them from the sickness. The sickness would not be able to penetrate through the birch bark. The lodge was built and the Elder asked everyone to come into the lodge where they would be protected from the illness. However, many people did not listen to her. It was those people who died from the great sickness. Once the sickness had passed, the people came out of the lodge and began burying those who had perished. They were buried in mounds. This is one story of how the mounds came to be.” Annie Wilson, Rainy River First Nations Oral History. Evidence suggests Early Precontact peoples were the first group to travel through this region approximately 8,000 – 9,000 years ago. As hunters, Early Precontact peoples travelled these lands following herds of animals that served as food sources. Artifacts including parallel flaked spear points, bifaces, scrapers, and stone flakes from tool making have been recovered from sites nearby. The Middle Precontact Period dates to between 2,000 – 8,000 years ago. Groups during this period are known to have worked with naturally occurring copper sources, mainly from Lake Superior. The copper would be crafted into tools including adzes, spear points, and awls. During this time, people depended on a variety of food resources, including moose and other big game, as well as fish and various plant resources. Implements for hunting and fishing included stone and copper fish hooks, projectile points, and a hunting tool known as an atlatl that is used to launch a large dart with a stone point on the end. These types of artifacts are found on sites near Kay-Nah-Chi-Wah-Nung. The Laurel Complex is part of the Late Precontact Period, also known as the Woodland Period. Groups attributed to the Laurel Complex resided in the area from approximately 800-2000 years ago. With an elaborate social and ceremonial structure, peoples of the Laurel Complex were the first mound builders in the Rainy River region. Both the landscape and Manidoo Ziibi or Spirit River at Kay-Nah-Chi-Wah-Nung, provided abundant sturgeon and other wildlife, which is one of the reasons why people gathered here in great numbers in the spring. It is told by our Elders that at any one time, hundreds of people would have been here. The peoples of the Laurel Complex left visible evidence of past generations through the creation of the burial mounds that remind us all of what a sacred place Kay-Nah-Chi-Wah-Nung is. The Blackduck and Selkirk Composites existed largely contemporaneously around 300-800 years ago. The artifacts of the Blackduck Composite were similar to those from the Laurel Complex, and there is speculation that the material culture from the Blackduck and Selkirk Composites evolved from that of the Laurel Complex. There are similarities between all three groups, including pottery making, although the pots differ stylistically. Blackduck and Selkirk pottery vessels are more globular in shape, while Laurel vessels are conical, and all three are known for differing types of decorative patterns that typically occur on the rim of the vessels. Since Manidoo Ziibi was part of a continent-wide trading network, groups from this period had contact with many other groups from across North America. 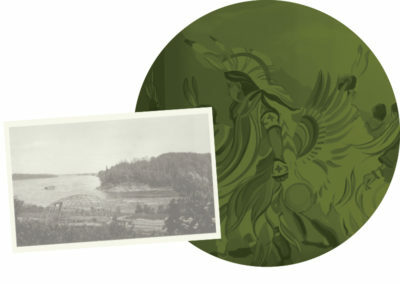 Voyageurs and explorers arrived to the region in the late 1600’s, during a period when battles were being waged between the Sioux and the Ojibway. With European influence in the region came change for the Indigenous populations who were faced with learning to live with the settlers and their new innovations. In 1873, Treaty No. 3 was signed between the Government and the Ojibway. The results of the Treaty greatly affected the lifestyle that had previously been known. Over the following century, the Ojibway people would adapt to a new way of life while still maintaining strong ties to the traditions of their ancestors. These traditions are still shared today at Kay-Nah-Chi-Wah-Nung.